We are looking for scientists of every discipline to brainstorm, co-write, and jointly submit to scientific reviews several titles, in view of providing relevant inputs to the IPCC Special Report on "the impacts of global warming of 1.5 °C above pre-industrial levels and related global greenhouse gas emission pathways". The Economics Web Institute has launched a Call for Co-Authors for a preliminary list of 14 titles, in order to accelerate their production, improve their geographical and sectoral coverage and increase the likelihood of acceptance. We are open to accelerate also others that you might propose, covering issues highlighted by the official commented outline and table of contents as well as by our "The Paris Agreement footprint on the IPCC Special Report on 1.5°C of global warming - an input to the scoping meeting and process". as well as Joeri Rogelj, Debra Roberts, Saleemul Huq, Harald Winkler, Kevin Anderson and Achim Steiner. Our side-event to the conference took place on the 22nd September at 13.30, in Seminar Room 2. 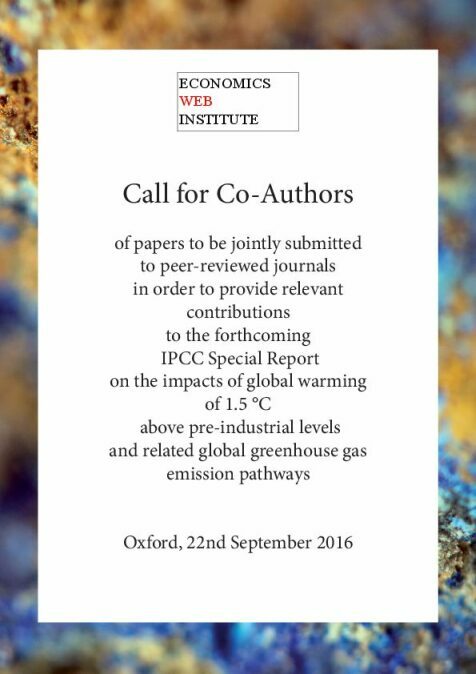 For the preliminary list of titles see this complete Brochure of the Call for Co-Authors. For instance, we are looking for documentation and chapter writing about historical experiences of emission cuts in the order of 13%-20% in a year, in sectors or subsectors, in single countries or at a sub-national level. If you are interested in participating and getting more details about possible ways forward, please write to director@economicswebinstitute.org.